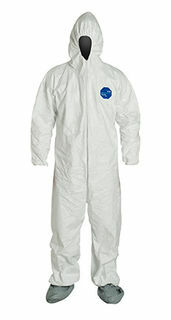 DuPont TY122SWHXL002500 Tyvek® 400 Coverall, Respirator Hood, Elastic Wrists and Waist, Att. Skid-Resistant Boots, Serged Seams, White, XL | Products | Personal Protective Equipment | Coveralls | Hooded & Booted Coveralls | Respirator Fit Hood | Scientific Sales, Inc.
DuPont™ Tyvek® 400 Coverall. Comfort Fit Design. Respirator Fit Hood. Elastic Wrists. Attached Skid-Resistant Boots. Elastic Waist. Serged Seams. White. Tyvek® 400 garments are composed of flash spun high density polyethylene which creates a unique, nonwoven material available only from DuPont. Tyvek® 400 provides an ideal balance of protection, durability and comfort of any limited use fabric technology. 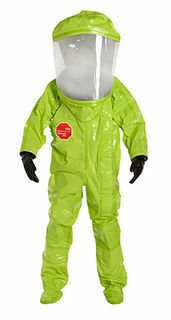 Tyvek® 400 fabric offers an inherent barrier to particles down to 1 micron in size. Protection is built into the fabric itself; there are no films or laminates to abrade or wear away. Tyvek® 400 fabric's durability advantage over microporous film and SMS fabrics delivers consistently better barrier, even after wear and abrasion. Applications include: lead and asbestos abatement/remedation, general maintenance/operations, spray painting, general clean-up.